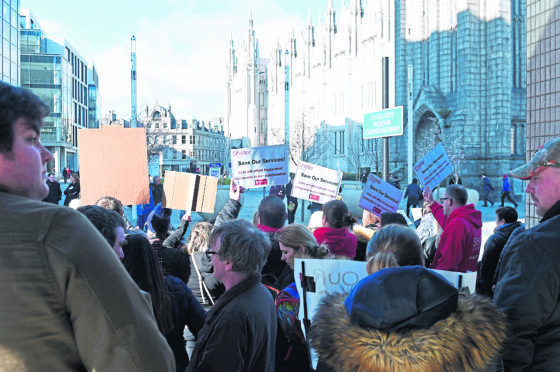 The protest against council budget plans outside the Aberdeen Town House, Aberdeen. Picture by Darrell Benns. Council tax in Aberdeen will go up by 4.5%, parking charges will be increased by up to 14% and a new brown bin charge introduced to save the local authority more than £41million. Aberdeen City Council set its budget yesterday, with co-leader Jenny Laing describing the cuts as “by far the worst” she has had to make. Libraries, public toilets, community centres and school crossing patrollers will not face cuts, and popular festivals Granite Noir and True North will continue. Major infrastructure projects including the completion of the art gallery, Provost Skene’s House, TECA and Union Terrace Gardens will also progress. But organisations including Sport Aberdeen, Aberdeen Performing Arts, Visit Aberdeenshire and Aberdeen Sports Village have had their funding slashed, with cuts also made to winter maintenance, pothole repairs, street sweeping and roadworks. Mrs Laing blamed the swingeing cuts on the ever-decreasing Scottish Government funding and that as a result, huge savings will be needed for the “foreseeable future”. Co-leader Douglas Lumsden said: “Our industries make significant contributions to the exchequer – yet we have a Scottish Government settlement, which essentially bites the hand that feeds, threatening the economic growth in our city that Scotland relies on for its prosperity. “Aberdeen has a proud record of maintaining low charges across operations and for many we have been able to freeze fees and charges. In the budget this year, we have reluctantly had to move on that position. Opposition SNP group leader Stephen Flynn however laid the blame at the door of the administration, pointing to many overspends and rising debt levels. In their alternative budget, they argued the £22million upgrade of UTG should be halted with £3.1million allocated to the fund instead. Members also put forward a 3% rise in council tax, but also proposed a massive rise in day care centre charges. Mr Flynn said: “We have heard a lot about the funding given to this council but less about some of the priorities of the administration. “Instead we have an administration that puts the entire blame for their failings at the door of the Scottish Government. “Our proposals were fully costed and saved the city from many of these cuts to the likes of grass-cutting, street lighting and cultural assets. But Aberdeen Labour’s Mrs Laing hit back and accused the SNP of “populism”. She added: “They talk about infrastructure but without infrastructure how do you attract people to the city? 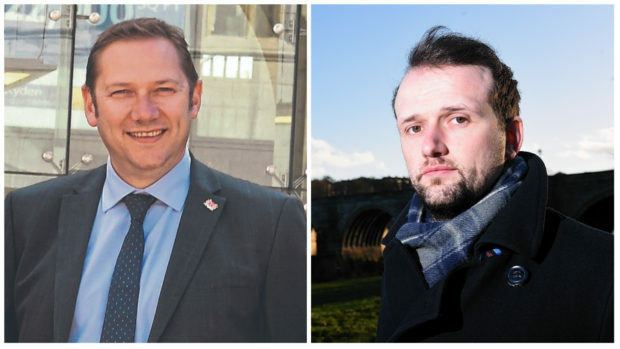 Conservative councillor Ryan Houghton accused the SNP of “asset stripping the council” while the SNP said the administration were balancing it “on the backs of the poor”. The leader of the Liberal Democrat opposition group Ian Yuill said: “This is my 24th budget and is by far the worst I have ever seen. Following the stormy townhouse debate, the administration’s budget was carried.